This definition of a bookkeeper paints a picture of someone who only speaks in numbers. But, the story behind Meghan Blair-Valero and the company she started, Fogged In Bookkeeping, is so much more than the basic definition above. The beginnings lay in survival, and for the greater good of one’s family. Now, Fogged In Bookkeeping is a successful, local business that helps other local businesses keep their finances in order and to thrive. I was able to sit down with Meghan, talk about her beginnings, get to know her more, ask her advice, and why she decided to become a Nantucket Ally. I felt fortunate to do so. She is an impressive woman. She is smart, successful, driven, and beautiful person inside and out. When I first met with Meghan Blair-Valero, I had just formed our LLC. Ink still fresh on the paper, we were now taking the next step towards launching Nantucket Allies: meeting with local businesses. I would be lying if I said I wasn’t nervous to meet with Meghan. I was very intimidated, to say the least. For about a year, I had been researching local businesses and watching how each business interacted within the island community. From my research, I knew that Fogged In Bookkeeping, Meghan’s company, was on the top of my list of businesses that I needed to contact and to learn from. From my observations and research, the impression I received of Meghan was that of a focused working mother who is self-made. I am forever grateful that she would be the first business-owner I would meet with to share what the Nantucket Allies mission is all about within the Nantucket Island Community. “Invest in a bookkeeper when you start a business. You don’t want to end up going to a bookkeeper when you’re in a desperate moment and adding stress to your life. The longer you wait to address the issue and get some help, the harder it is to fix. If you’re apprehensive about going to a bookkeeper: Identify why you’re nervous. -Confidentiality/Embarrassment: They don’t want to show their “underwear” to the world. It’s not the world, I’m one person. The farthest it goes is to the secretary and me. Fear of starting a business: “Human beings in general, we have this whole lobe in our brain whose job it is to tell us that ‘this is scary,’ and we shouldn’t do it. Good entrepreneurs of the world hear this nervous-system message and say, ‘Yeah that’s nice. I’m still doing this.’ And they move forward. We all have those fears. Build a good team: You sometimes can’t do everything as well as outside people may. “The sooner you acknowledge that your business will grow better, you’ll have a better product or service, if you learn to trust good professionals, and the better off you’ll be. A Good Lawyer – Have an attorney to call. Something legal always pops up, and you may not have a week’s time to find someone. Have someone in your back pocket. A Good Accountant – Have one from Day 1 to tell you the best way to organize your business. If you go an entire year and you lose money or make money without some prior planning, entity choice, you could end up sinking your business by owing a bunch of taxes at the end of the year. A Good Insurance Agent – Someone looking out for your best interests, what’s in your budget, and what is the best long-term plan for you. Q&A: Some fun questions I asked Meghan…I think you’ll love what she has to say. If you had 24 hours on Nantucket what would you do? -Beach: South Shore – somewhere where there’s not a lot of people…You have to drive down a dirt road to get there. -You must eat while you are here…we have some of the best restaurants in the world! American Seasons and Straight Wharf are a must. If you can do one for lunch and one for dinner…bonus! -Have to go to the (Cisco) Brewery. Everybody, no matter your social, economic, political bent, or whatever, there’s a place for you at the Brewery. -At least one in-land excursion: Whether you take a walk at Squam Swamp or spend time in the state forest, there are great, beautiful things away from the shore to enjoy. If you could trade Jobs with one person on Nantucket for one day who would it be? I would trade jobs with my friend John Burdock, he’s a bartender at Pi. You meet amazing people, get to talk to them all day, and it’s not a rigged job. I would sling drinks! Why did you decide to become a Nantucket Ally? The time has come in our economy to think differently about business. I think we have to explore, be innovative and try something different. Here on Nantucket, it’s time for us to explore how to expand our year round economy and make a healthy ecosystem for business. It’s us, the business owner’s job, to support ourselves. Things like Nantucket Allies are interesting, different ways at looking at how to encourage our business economy. Encourage to keep it local, utilize their peers, to get to know who their fellow businesses are, and to encourage an environment that fertilizes itself. That’s why I decided to support Nantucket Allies. I wanted to see a society that is taking care of itself and not, sort-of, waiting for the outside to solve the problem. I want to thank Meghan Blair-Valero of Fogged In Bookkeeping for sharing her time with me and supporting Nantucket Allies in our mission. She inspires me to be a better person, and has taught me some lessons on how to be a better business owner. 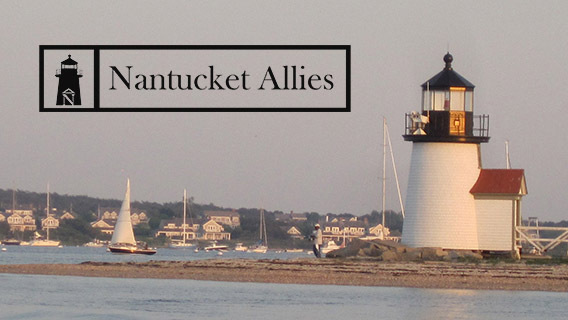 Henry Ford once said, “Coming together is a beginning; keeping together is progress; working together is success.” With the help of Fogged In Bookkeeping, I know the Nantucket Allies Community will be able to flourish and succeed in helping Nantucket. Thank you, to Meghan and all of those who help her on a daily basis at Fogged In Bookkeeping!